The Government of India has requested the possible sale of one C-17 transport aircraft with four Turbofan F-117-PW-100 engines. The sale would also include one AN/AAR-47 Missile Warning System, one AN/ALE-47 Countermeasures Dispensing System (CMDS), one AN/APX-119 Identification Friend or Foe (IFF) Transponder, precision navigation equipment, spare and repair parts, maintenance, support and test equipment, publications and technical documentation, warranty, Quality Assurance, ferry support, U.S. Government and contractor engineering, logistics and technical support services, and other related elements of logistics and program support. The estimated cost is $366.2 million. The principal contractor will be the Boeing Company, Chicago, IL. The purchaser typically requests offsets. Any offset agreement will be defined in negotiations between the purchaser and the contractor. In a report Boeing Ends C-17 Production in California, published in Nov 30, 2015 it was stated Boeing closed out C-17 deliveries and seven decades of aircraft production in Long Beach, California. One aircraft that remains unsold and in storage in Texas, takes the overall production tally to 279. While Boeing continues to provide support, maintenance and upgrades to the airlifter fleet under the C-17 Globemaster III Integrated Sustainment Program (GISP) Performance-Based Logistics program, the future of the production site at Long Beach remains undecided The C-17 is the last series-built, fixed-wing aircraft to be completely assembled and delivered in the state. Sandwiched between Iraq, Afghanistan and Pakistan, it seems almost miraculous that Iran hasn't suffered a major act of domestic terrorism in over 15 years. But that changed on June 7 when twin attacks in Tehran left 17 dead and around 50 injured. The Islamic State swiftly claimed responsibility for the attack, and the Iranian security apparatus switched into high gear, working to round up suspects and prevent other plots from culminating. Iran has always tightly protected its core territory, even if the country's restive periphery has traditionally been a source of instability. Now Tehran is concerned about the southeastern and northwestern reaches of the country, especially growing militancy among the Kurdish and Sunni minority groups that live there. In response to the Islamic State's violent statement of intent, the pace of counterterrorism activity has increased across the country, and a June 14 raid in the southeastern province of Sistan-Baluchistan targeting suspected terrorists left two dead and five in custody. The reason for the Islamic State's heightened activity in Iran is relatively straightforward: It is easier and cheaper to wage terrorism and insurgency than to fight conventionally in the hope of taking, holding and governing large swaths of territory. The Islamic State has suffered significant losses on the battlefield, which has damaged its reputation — a problematic result for an organization that thrives on its perceived ruthlessness and potency. Desperately needing to reinvigorate its brand, the group hopes that high-profile successes like the recent Iran attacks will energize its support base once more. One of the best ways to track Iran's priorities in Syria and Iraq is to follow the movements of one of its highest-ranking military leaders, Maj. Gen. Qassem Soleimani. In September 2016, the commander of the Islamic Revolutionary Guard Corps' (IRGC's) elite Quds Force made an appearance south of Aleppo just before loyalist forces launched the final offensive that led to the critical city's capture. Seven months later, he was spotted in the northern Syrian governorate of Hama as loyalist troops, backed by Iran, geared up for a difficult fight with rebel forces on the outskirts of the provincial capital. This month, Soleimani is on the move once again. On June 12 the elusive figure paid a visit to Iranian-led militia units on the border between Syria and Iraq, giving prayers of thanks for their recent victories in the area. His presence is telling of the newest phase unfolding in Syria's protracted civil war: the race to the Iraqi border. As the Islamic State is slowly being driven out of Syria, its enemies are scrabbling to pick up the territory it leaves behind. Syrian rebels, supported by the U.S.-led coalition, are facing off against the government of President Bashar al Assad, backed by Iran and Russia, to wrest control of the extremist group's remaining positions from its weakened grasp. Yet despite having the same finish line in sight, each participant is driven by its own interests, and is willing to risk colliding with its rivals to secure them. Prince Turki stated one of the great constants of US media coverage of the Saudi Princes. The classic is the 1994 book by Said K. Aburish, The Rise, Corruption and Coming Fall of the House of Saud . Since then there have been thousands of articles by experts and gurus predicting the imminent fall of the Saudi Princes. Here are a selection of these from past 2 years. 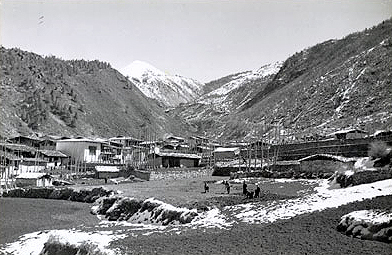 The 1967 incident marked the last incident of casualties on both sides in the Sikkim sector. And the last death in any sector of the India-China border was in 1975 at Tulung La, and that was by accident, when two patrols were lost in the fog. India gave China a bloody nose in 1967 which was the last Sikkim stand-off. China was irritated with presence of Indian Army in the then Kingdom of Sikkim. Maj Gen Sheru Thapliyal (retd), who was posted in Sebu La, recalled the 1967 incident. The last time India and China were engaged in a major military stand-off in Sikkim was in 1967. On that instance, just five years after India's traumatic 1962 war defeat, the Indian Army gave the Chinese a bloody nose, according to accounts from the time. More than 80 Indian soldiers were killed, while estimates say between 300 to 400 Chinese troops were killed. It was certainly a different time: One account suggests that to protest China's actions then in Sikkim, which reportedly included a Chinese complaint of a herd of sheep being stolen, a 43-year-old Member of Parliament by the name of Atal Bihari Vajpayee drove a herd of sheep to the Chinese Embassy in Shantipath in New Delhi to stage a rather colourful protest. There are fascinating parallels from the 1967 incident. That was also a stand-off that began with pushing and shoving, when the Chinese filled up trenches that India had dug. Should the Chumbi Valley be occupied? On November 21, 1950, hardly a month after the People's Liberation Army had invaded Tibet and occupied the town of Chamdo, the Political Officer in Sikkim, Harishwar Dayal send a Top Secret cable to his bosses in the Ministry of External Affairs in New Delhi. It could be said that some parts of Dayal's assessment were prophetic. But who was ready to listen to him in Delhi? Dayal analyzed: "Occupation by China of the whole of Tibet or of portions of Tibetan territory bordering India, Nepal and Bhutan, or establishment of a Chinese-inspired regime at Lhasa, will create a variety of problems which are doubt engaging Government of India's attention." It is very unfortunate that Nehru's government did not pay attention to this basic fact. The cable contains an interesting suggestion from the strategic point of view: India should occupy Chumbi Valley. Dayal writes: "it was suggested that we might consider occupation of the Chumbi Valley up to Phari in an extreme emergency. This suggestion was NOT favoured by Government of India at the time. It was however proposed as a purely defensive measure and with NO aggressive intention. An attack on Sikkim or Bhutan would call for defensive military operations by the Government of India. In such a situation occupation of the Chumbi Valley might be a vital factor in defence." The Doklam Plateau, north of the tri-junction of Sikkim, Bhutan and Tibet, by India's claim, is not just a disputed area, but has huge strategic significance for both India and China. The few square kilometres of the plateau, which one officer familiar with the terrain calls “more a ledge than anything else” because of its steep mountains, is witnessing a stand-off between detachments of the Indian Army and the People’s Liberation Army (PLA) for the past few days. There have been several incidents that have culminated in the present situation, sources said. In recent days, the Chinese are believed to have destroyed temporary bunkers of the Indian Army, while the Indian Army is accused of objecting to a road construction by the Chinese side on the disputed area. Finally, there was also an incident of jostling among the soldiers of the two sides. Although the Sikkim border between China and India has often been a source of diplomatic and military tensions in bilateral relations, the Sino-Indian frontier has been largely quiet since 1967 when the two armies fought a short but brutal local war. But it would be incorrect to infer that with such large concentrations and spread of troops, often eyeball to eyeball, that there is no tension. Why did the latest military standoff break out? Both sides have resorted to blame game accusing each other of crossing the boundary. But what has really happened? Is it a coincidence that it occurred just days ahead of Prime Minister Narendra Modi’s summit meeting with Donald Trump? James Bond once famously said: "Once is happenstance, twice is coincidence and third time is enemy action.' Such flare-ups at a time when the Indian leadership is meeting with leaders like Xi Jinping and Donald Trump are now running out of coincidences. A clear pattern is now emerging. Whether it is our side that is provoking it or theirs doesn’t matter much. The Indian public believes it is China that is ratcheting up the tensions. The Chinese public thinks it is India. In the new world of mass and instant communications perceptions are the truth. However some light is peeping out from under the shut doors of the two militaries. At the farthest tip of the Chumbi Valley between Sikkim and Bhutan, the Chinese are building a road to an area called the Dokalam Plains. Our military believes that artillery positioned here will seriously threaten Indian concentrations and communications. It doesn’t help very much that the Chumbi Valley appears on the map like a dagger poised not only to render asunder Sikkim and Bhutan, but also Assam and the Northeast from the rest of India. So the Indian Army wants to position itself to challenge the PLA’s dominance from the Doka La pass in Bhutan. There is nothing wrong about this, considering India and Bhutan have a treaty ratified military relationship. Clearly the two biggest armies in the world are jockeying for positions of advantage. This is natural when there are huge concentrations of troops, literally cheek by jowl, and trust is low between the two governments. 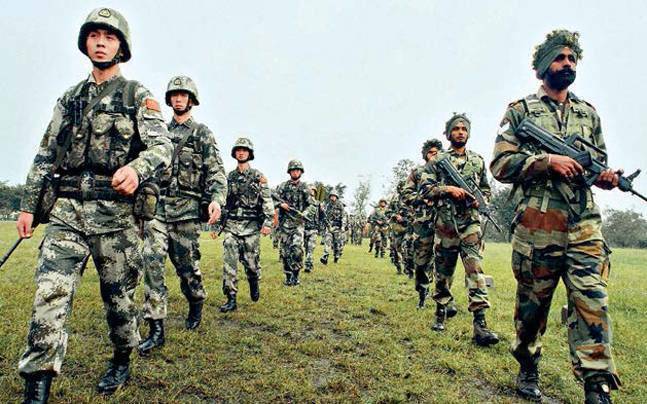 The choice of Dhoka La for the intrusion by Chinese troops is significant and suggests a twin objective of pressuring Thimpu to allow Beijing to establish an embassy there and reinforcing Chinese claims on Arunachal Pradesh, warns former RA&W officer Jayadev Ranade. Strategy, sovereignty and territorial interests are all at play in the stand-off currently underway between Chinese and Indian troops. 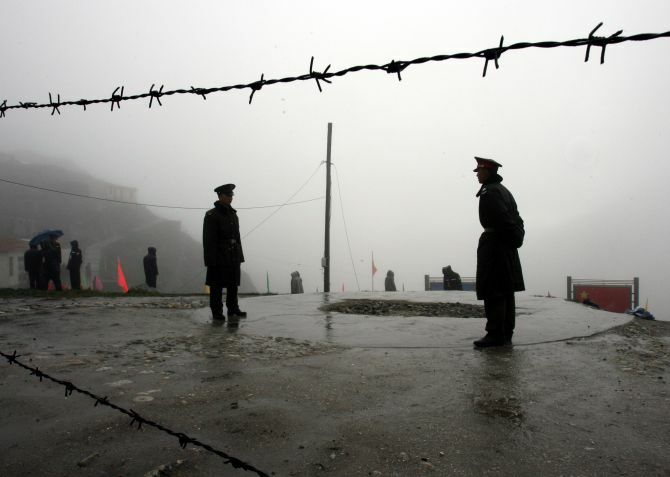 After nearly a decade, Beijing has chosen to reactivate the border with India in the Sikkim sector in the Dhoka La area in the tri-junction between India, Tibet and Bhutan. The face-off has now continued for over ten days with two flag meetings at the border failing to resolve the issue and defuse tension and both sides building up their troop strength in the area. In contrast to previous such occasions, this time statements emerging out of Beijing contain escalating rhetoric suggesting that China is hardening its position. The timing of China's intrusion, which coincided with Prime Minister Narendra Modi's first meeting with US President Donald J Trump in Washington is, at the least, a convenient coincidence. China has long been concerned about India's warming ties with the US and, with an unpredictable future for Sino-US relations under Trump, Beijing's worries will have increased. This was reflected in the article in the State-run Global Times on June 26, 2017, which actually warned that close Indo-US ties 'could even lead to catastrophic results'. The newspaper cautioned India that if it ceases to be non-aligned and 'becomes a pawn for the US in countering China, it will be caught up in a strategic dilemma and new geopolitical frictions will be triggered in South Asia'. The move towards a digital economy is likely to help trigger a fresh wave of economic growth, attract more investment, and create new jobs, across multiple sectors. However, it also poses a big challenge, that of cybersecurity. With the move towards a digital economy, increasing amount of consumer and citizen data will be stored digitally and a large number of transactions will be carried out online, by companies, individuals as well as government departments. That makes India a bigger target for cyber-criminals and hackers. Various stakeholders, especially Indian companies, need to be better prepared to handle this threat. The cost of cyberattacks in India currently stands in excess of Rs25,000 crore ($4billion). It is important to note that there are many cyberattacks that go undetected and unreported as well, so this number could be much higher. Maintaining law and order has become quite costly for the exchequer. In the past decade, the fastest growing element of the government’s expenditure has been that on police. This trend sits uncomfortably with that of a welfare economy. It is not a statistical jugglery that comes from a low base effect. The expenditure was over 3 per cent of the total government spend to begin with, which means it is higher than the paisa going to subsidies like food. In comparison with priorities such as health or education budgets the difference is even more startling. From that high base, there has been a further steep rise in government money spent to finance the expansion of police force. Both the United Progressive Alliance (UPA) and the current National Democratic Alliance (NDA) government have carried on with the trend. As the first table shows money deployed on policing by the centre has consistently outpaced that of any of the big ticket spending items of the government in the block of ten years. Neither has the defence or pay out of interest grown so consistently year on year. The scale of growth for police is in double digit in all the years. The only exception is the current financial year, but here too the numbers, as of now, are only budget estimates. The actual expenditure in most years has overshot them. At hearings on Capitol Hill earlier this month, Secretary of Defense James Mattis admitted that the administration currently doesn’t have a strategy for the war in Afghanistan, but promised one by the end of July. Given the number of troops his plan will reportedly include, however, the new strategy will at best ensure the war continues without resolution into perpetuity. Rather than anchoring the United States to a state of permanent failure, President Donald Trump should demand disruptive alternative policies that makes strategic success possible. Fortunately, viable options do exist. Numerous Senate and House committees have held hearings of late discussing Afghan war strategy, and there has been considerable debate among pundits regarding the number of troops that Mattis should deploy. Lost in these discussions is an examination whether the oft-stated objective (preventing terrorists from using Afghanistan to plan future terror attacks against the United States) is even achievable. Before troop levels can be set, an agreed-upon strategy has to be selected; before a strategy can be chosen, an achievable end-state must be identified. For well over a decade, no achievable end-state has been discussed, debated or assigned in Afghanistan—and that is the primary cause of the stalemate that currently afflicts U.S. policy there. In a previous post (Human History Greatly Simplified), I simplified human history over the past 2,000 years as the West vs. China. In this post, I will explain governance in China, its past, present, and future. I do it for the sake of my fellow Americans, with a strong message to America: you are 2,000 years behind China in governance! Chinese civilization over the past 2,000 years was primarily defined by the First Emperor, with his grand, but when compared with Rome, more realistic vision of "one written language, one culture, and one Emperor" (Ancient Rome vs. Ancient China) as the foundation. Largely because of that, China was, and still is, very simple to govern, especially when compared with the West, which has been troubled by multiplicity, including wide diversity in languages, cultures, races, and religions. In dealing with the stand-off with New Delhi over the T-Junction (meeting point of India, Tibet and Bhutan), the main plank used by Beijing is its "sovereignty" over the land. But whose sovereignty is Beijing talking about? If it's Bhutan's sovereignty, China had an agreement to not disturb the status quo while boundary talks are continuing between the two countries. But China actually did the opposite — it violated the agreement by design and at a time when it coincided with Prime Minister Narendra Modi's visit to Washington, because of perceived threats to China's own expansionism. Major General Vetsop Namgyel, Bhutan's ambassador to India, told the media, "The PLA (People's Liberation Army) started construction of a motorable road in the Doklam area towards a Bhutanese army camp at Zomphlri. We are in boundary resolution talks with China and have written agreements that pending final boundary settlement, peace and tranquility will be maintained along the boundary, and that both sides will refrain from unilaterally altering the status. Bhutan has conveyed to China that road construction is not keeping with the agreements between two countries. We have asked China to stop the construction and refrain from changing the status quo. Doklam is near the tri-junction, and is part of boundary talks between Bhutan and China." Russia’s next-generation battle tank can reportedly out-stick the American armor in a heartbeat — and it’s coming to battlefields sooner than expected. Russian weapons manufacturer Uralvagonzavod plans on testing the T-14 Armata battle tank at a test range in the industrial city of Nizhny Tagil, deputy prime minister Dmitry Rogozin told Russian media on June 20. In development since the collapse of the Soviet Union and first unveiled as a prototype in 2012, the Russian military is currently field testing 100 Armatas with hopes to deploy the tank downrange as early as 2019. Should the new armor exceed expectations, the Russian Defense Ministry plans on procuring a total 2,300 by 2020. The Armata is certainly a muscular machine. Army Recognition’s comprehensive technical specs indicate that the tank’s unmanned turret comes with a next-gen 125mm 2A82-1M smoothbore auto-loading main gun with 45 shells, although future variants of the Armata could boast a 152mm cannon and, allegedly, low-yield nuclear rounds. Potential secondary weapons range from a 12.7mm machine gun like the Nikitin-Sokolov-Volkova (NSV) currently utilized by the Russian military’s T-72, T-64, and T-80 battle tanks; a remote weapon station with a 7.62mm machine gun; and a 57mm cannon Army Recognition characterizes as a “grenade launcher,” although most Soviet-era weapons of that caliber are anti-tank and anti-aircraft cannons. Reciently a U.S. Navy F/A-18E Super Hornet shot down a Syrian Air Force SU-22 after it bombed U.S. backed rebel fighters in Raqqa province, Syria. Russia condemned the incident, calling it a "flagrant attack", saying it would have "dangerous repercussions". The Russians have now said that any coalition aircraft operating west of the Euphrates river will be tracked and treated as targets. The crowded airspace in Syria did see another high-profile incident in 2015 when Turkish F-16s shot down a Russian SU-24 attack aircraft, killing one of its two pilots and leading to a serious diplomatic spat between Moscow and Ankara. The role of U.S. special operations forces (SOF) in the Middle East has expanded steadily since the inception of the counter-ISIS campaign in 2014. In part, this expansion is due to the metastasis of ISIS into Libya, Yemen, and other countries beyond its major land-holding presence in Iraq and Syria. But the most notable feature of the expanded U.S. SOF role in the Middle East has been its work alongside indigenous forces in Iraq and Syria. Conventional and coalition forces provide additional numbers of troops. What makes this campaign so unusual is that U.S. forces are not providing the muscle of the frontline combat troops. Instead, the campaign is conducted “by, with, and through” others, a Special Forces phrase that the CENTCOM commander, General Joseph Votel, has adopted to call attention to this new way of warfighting. If the counter-ISIS campaign succeeds in dislodging ISIS from Iraq and Syria, this approach is more likely to be considered for other, similar conflicts. During seven weeks visiting Iraq, Syria, and neighboring countries this year, I observed three major changes in how the campaign accounts for its increasing momentum. First, the number of advisers and supporting forces has now reached a level that can provide meaningful support to the variety of indigenous forces fighting ISIS in Iraq and Syria. That number is hovering around 10,000, including forces deployed in-country on temporary duty. 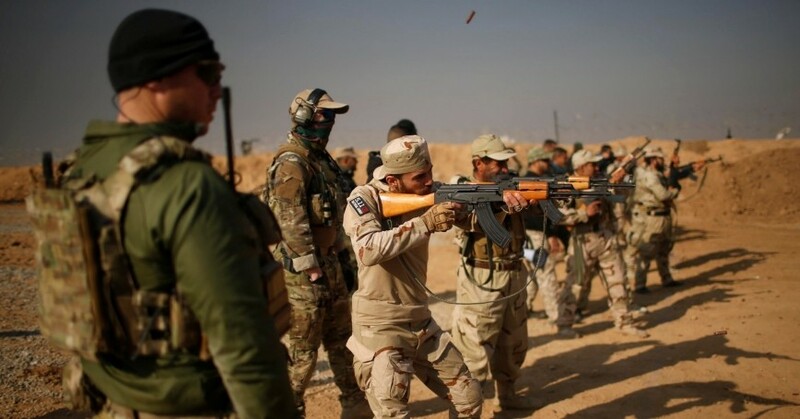 Special operations forces are advising a variety of partners, including the Iraqi Counter Terrorism Service (CTS), tribal forces and Iraqi Kurds. In Syria, they are assisting Kurdish groups, particularly the YPG (Popular Protection Units), and a variety of Arab forces. As in Afghanistan, U.S. SOF count on major support from their closest SOF partners in Britain, Australia, and Canada, as well as the Danes, Norwegians, and French. While SOF are at the forefront of the tactical-level advising, U.S. and coalition conventional forces have been training forces at five main bases and advising at the headquarters level. There is a buzz in the air. Scholars, service members, bloggers, and journalists are all writing about a new U.S. Army and Marine Corps concept for future warfare. Yet to some, this concept might sound familiar, closely resembling things that came before. In the absence of any substantial formal document (save for a white paper), there is much confusion, and the term slowly but surely is becoming a catch-all phrase, pasted with varying degrees of relevance across articles, news stories, and PowerPoint slides. So, what is this Multi-Domain Battle that everyone seems to be talking about? Is it a brave new concept that will carry the day and the Army to a revolution in military affairs? Or is it just AirLand Battle with a dose of cyber? I thought I’d try to summarize, for the baffled, short-on-time reader, the essence of this idea as it stands today. Given the amount of relevant material available online, this effort will, by no means, be a comprehensive coverage of the current debate. It will, however, try to serve as a basis for more concrete discussions in future articles about alternative warfighting concepts and relevant force structures. First, I turn to the official documents regarding this new concept. Then, I tackle several themes that emerge from the unofficial writing trying to describe Multi-Domain Battle. The future of intelligence is small teams and tiny satellites. It’s not a future the U.S. will own exclusively. Detecting an adversary’s unscheduled naval exercise used to require a massive operation perhaps involving multiple agencies. In March 2017, a small team of analysts with a firm called 3GIMBALS, working with U.S. Southern Command, used imagery from a constellation of inexpensive microsatellites to pick up an unscheduled military exercise in Venezuela that had taken place a year prior. How they did it says a lot about the future of intelligence collection from space, where the U.S. has a rapidly shrinking advantage. The game-changer wasn’t the algorithm; it was the availability of cheap, daily satellite imagery — in this case, from a startup called Planet Labs. [Full disclosure: Defense One has an agreement to get limited free imagery from Planet.] With a constellation of 149 microsatellites, Planet can cover a lot more territory than any single high-end satellite, so almost anywhere in the world you look, Planet can find a recent picture of it. With new imagery coming in every day, you can automate a search for changes at various locations. That means you can detect when a military begins to operate in a given area, and perhaps even deduce what kind of equipment they’re using — all at exponentially less cost than it would take to have run the same operation a decade ago. The Department of Defense (DoD) has begun its development of a new defense strategy, and outside observers are atwitter, or should I say, aTwitter. Having been involved in more security strategy efforts than is healthy for any human, I have empathy for those charged with strategy development in today’s chaotic Washington environment. When it comes to strategy development, it can often feel that, as the French say, plus ça change, plus c’est la même chose. A defense strategy is an approach that ties together the goals, approaches, and resources (people, technology, dollars, etc.) that can best advance priority interests by exploiting opportunities and overcoming challenges. It must account for, and in some cases seek to shape, a complex and dynamic backdrop of American domestic politics and economic realities, as well as developments in operational concepts and technology, demography and workforce, and of course geopolitics. U.S. defense strategy is almost never considered successful in fulfilling these roles and forecasting well along these dimensions. Then again, it’s hard to know what right would look like. Some strategies lauded in the near-term have turned out to be short-lived in perspective, such as the 2012 Defense Strategic Guidance, which was built on several assumptions that aged poorly. Some strategies praised by commentators today were deeply criticized at the time, such as Harry Truman’s NSC-68 or Bill Clinton’s Bottom-up Review. These observations should assure the well-intentioned and thoughtful strategist that, in strategy, the term paper rarely earns an “A.” Good strategy is a non-linear process that must constantly be tended and adapted, and vigilance is rewarded. A “grey war” is being waged online as cyber attacks sweep the globe - with “geeks” needed to confront the threat, Defence Secretary Sir Michael Fallon warned today. The Armed Forces needed to recruit a new generation of “geeks and tech wizards” to tackle the spiralling threat of cyber warfare, Sir Michael said. He told the Royal United Services Institute’s Land Warfare Conference: “We have anonymous cyber foes, sponsored by state or non-state entities, lurking behind the veil of encryption, targeting our national infrastructure as we saw with the recent cyber strike on Parliament itself. From an American perspective, the operation as described could look defensive—if it was “designed to be detected,” it would serve as a warning and potential deterrent against further offensive actions by Russia. Or it could be used purely in retaliation for aggression of some kind. On the other hand, though, once the implants are operational, what’s to stop an American leader from using them for offensive purposes, simply to weaken, undermine, or otherwise mess with Russia? From the Russian perspective, this potential would make the implants look like an offensive cyberoperation—and prompt “defensive” measures on Russia’s part, that would in turn threaten the United States. The cycle could escalate from there. Cyber attacks against government agencies, infrastructure providers and other high-profile targets are regularly in the news, stirring talk of digital warfare and international sanctions. The forensic investigations that follow these hacks can reveal the method and magnitude of an attack. Pinpointing the culprit, however, is frustratingly more difficult, resulting in little more than vague accusations that the guilty parties (might be) working for a particular foreign government or cyber gang. Case in point: the recent cyber attacks that shut off power to 80,000 Ukrainians and infiltrated computers at the country’s largest airport. Some Ukrainian officials were quick to point the finger at the Kremlin due to their ongoing conflict and because the attacks apparently came from computers in Russia. Others, however, caution Internet addresses can be spoofed and that, even though investigators have recovered some of the “BlackEnergy” malicious software (malware) at fault, they are unable to figure out exactly who wrote it. The week-long challenge had graduate students from the Royal Military College of Canada competing against personnel from the National Security Agency, engineers from NASA, and five airmen from the 70 th Intelligence, Surveillance and Reconnaissance Wing’s 707 th Communications Squadron from Fort Meade, Maryland. The challenge was developed to help “increase awareness of space cybersecurity challenges and principles,” said Capt. JBernard Caplo, airman from the 707th CS. There were three separate objectives for the teams to accomplish: system hardening, offensive cyber operations and satellite operations. To prevent any unfair advantages, each team was provided a space mission kit that contained commercial off-the-shelf items needed to complete the two segments of the challenge, space and ground. The two segments required the teams to develop a cube sat containing a sensor board and simulated satellite thrusters using light-emitting diodes, and to secure a functioning ground station that allowed their cube sats to communicate through a secure shell connection. If you have not heard of or understand cryptocurrencies, you are not alone; but that had better change. Cryptocurrencies — a technology whose time seems to have come — has grown significantly as of late. The total dollar value of all cryptocurrencies exceed the gross domestic product of all but 84 countries in the world, according to the CIA World Factbook. That means the total value of all cryptocurrencies exceed the GDP of 145 individual countries, based on the CIA World Factbook! While many have not heard of or understand cryptocurrencies, you had better take notice — that is for sure! This is a powerful technology whose ramifications mandate that military, intelligence organizations and law enforcement must monitor and understand it. According to Investopedia, a cryptocurrency is a digital or virtual currency that uses cryptography for security. A cryptocurrency is difficult to counterfeit because of this security feature. A defining feature of a cryptocurrency, and arguably its most endearing allure, is its organic nature; it is not issued by any central authority, rendering it theoretically immune to government interference or manipulation. You can track the cumulative total U.S. dollar value of each individual cryptocurrency and the sum of all 863 individual cryptocurrencies using this online source. Intelligence drives operations. The same can be said for quick-reaction cyber forces when responding to an incident. Cyber protection teams, or CPT, are one of several teams that make up the cyber mission force for CYBERCOM. CPTs consist of 39 individuals and defend priority Pentagon networks and systems against threats. There currently is no plan to change the structure of these teams to marry intelligence-oriented teams or intelligence cells within them, which CYBERCOM calls cyber support teams. Allen said that outside of the cyber national mission force, which defends the U.S. against strategic cyberattacks, none of the other teams have an established process for intel. Mobile and IoT adoption continue to rise, enhancing communication and productivity across the enterprise—and unleashing an avalanche of security concerns. This ebook, based on the latest ZDNet/TechRepublic special feature, looks at the risks of IoT and mobile and offers strategies and recommendations that can help protect your organization against cyberattack. One of the biggest challenges with the Internet of Things (IoT) is the security headache that comes with it. This issue is exacerbated in the enterprise, where connected devices often control large, dangerous machines, or send and receive sensitive data. While IoT can bring new data and helpful insights, it also introduces new vulnerabilities into your organization. As such, it is critical that enterprises consider the security implications of an IoT deployment before moving forward. Here are 10 best practices for businesses, schools, factories, and other organizations looking to improve their IoT security. Each new IoT endpoint introduced into a network brings a potential entry point for cybercriminals that must be addressed.